Just think how many pairs of gold earrings you've bought over the years! And chances are you don't wear many of them anymore. We buy any gold earrings and would like to purchase your entire collection of no longer worn gold earrings including gold hoops, gold dangle and drop style earrings, gold earrings with diamonds or gemstones, and diamond and gold stud earrings. You've only got one set of ears, so feel free to sell extra pairs of gold earrings! 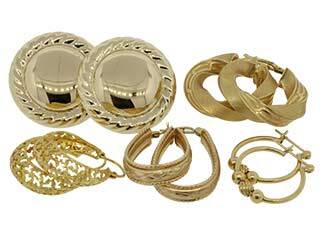 Sell your gold earrings and diamond or gemstone earrings to Cook County Buyers. Each pair of earrings in the photo to left weighs between two and six grams of 14k gold, and can easily bring up to $100 a pair or more depending on actual weight. Earrings with diamonds can bring big money, especially if there is one large stone in each earring. Observing the current gold price daily from our website can ensure you get more for your gold at the right time. Look to the left and you will see a red line on a chart. This line represents the current spot gold price and moves up and down in small amounts all day long. Your gold earrings will be priced according to their weight and this live gold price at the time of sale! Selling gold earrings to Cook County Buyers is easy. If you or someone you know has a habit of buying a different pair of gold earrings every couple months, you may have a jewelry box packed full of earrings waiting to be converted into cash that you can use to buy even more gold earrings! 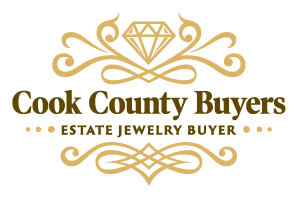 Contact Cook County Buyers to discuss your gold earrings for sale!